In conjunction with the installation of solar panels, the incandescent bulbs in my rig were switched over to LEDs. The amount of power drawn is considerably less with the LEDs. And, that should assist with conserving battery usage while boondocking. 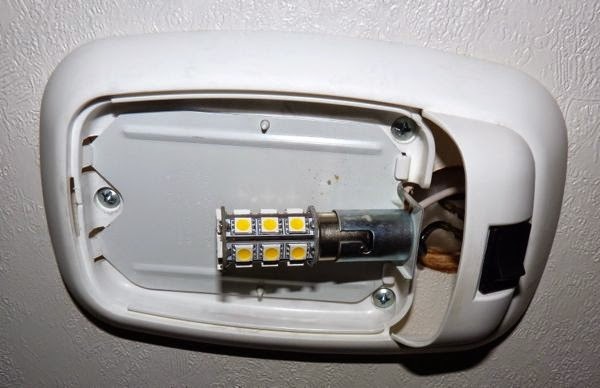 First, I replaced all the standard #1141 bulbs in ceiling lights, using 24 LED/360 lumens barrel type with the same base. 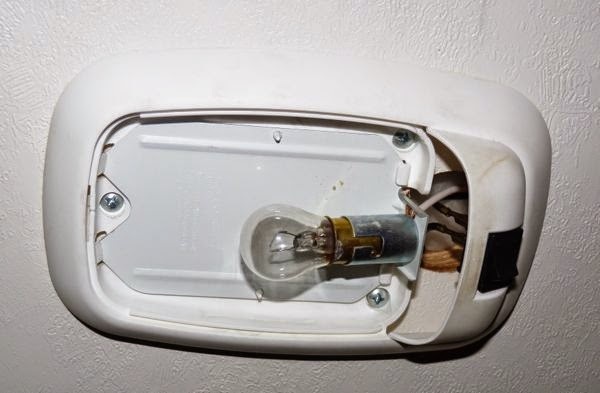 There were seven bulbs to replace including the outside entry light. However, that one I have not exchanged yet, as it is rarely used. I used the warm variety for most of them, but did use the cool in the entry hall. I like the more daylight color for general areas. But, the warmer ones are better for specific use like in the galley and head. Second, the tiny light in the stove hood was not good for much except as a night light. 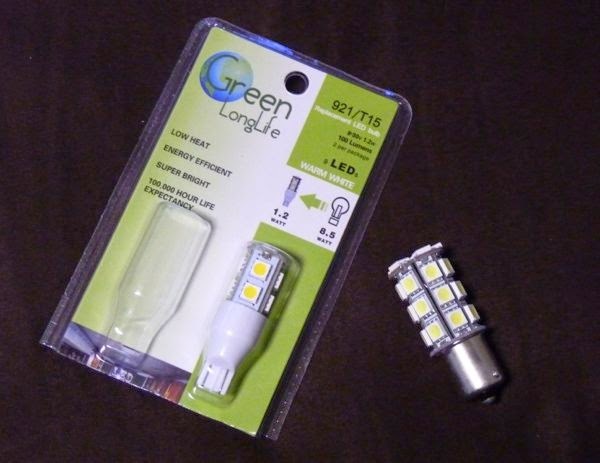 Then, I came across a 9 LED replacement at an RV parts store. At 100 lumens it provides far more light on the stove surface for cooking. 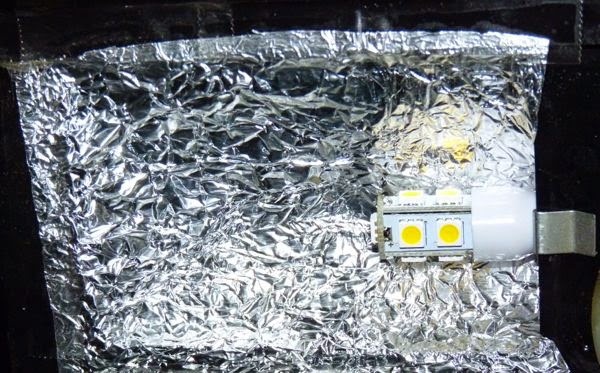 The original bulb was recessed, so I moved it to the front (a simple clip), and put aluminum foil behind it to reflect more light downward. Now it works superbly! A night light, near the floor, and a safety light in the entry step have not yet been changed to LED. Perhaps when they fail, I will reconsider it. Also, the four fluorescent fixtures have not been altered. I don’t use them much. Plus, a friend that has a similar solar setup as mine, told me they were a non-issue with a 300Ahr battery bank. So far, the LED lights are working great, and they seem to produce more light than before, while using fewer amps. For more posts that show other mods to the rig see the Tardis page. Every little change help conserve. You’ve got that right. It’s surprising how the little things really add up. I like that idea. Maybe I should do the same thing, although I rarely boon-dock, since I would have to run the generator to power my oxygen machine which I use at night. Solar might be able to handle your situation; check into it. How do you dispose of your old light bulbs? I have been told they shouldn’t be put in the regular trash, but what DO you do with them? I kept the old ones since they still work. Pretty sure that most cities have a place to recycle the old bulbs. We got a couple of these LED lights to add to our band’s stage lights. We use them more like accent lights. They’re small and really affordable. We like them. I’m really glad I did this. I like the light and the savings.